One of a triptych depicting the wonderful lanes that traverse Melbourne inner suburbs. On a walk one day I spied a cat peeping from the broken fence and captured it on camera to later render in oil. 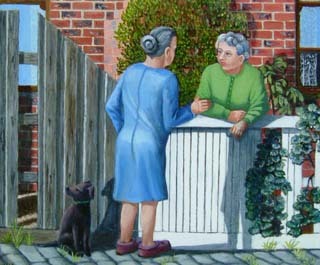 I included the painting of Tom the dog and gossiping women to complete the narrative. The other two paintings in the triptych feature the cats Marmalade and Molly. It all goes on in the lanes!